This outstanding and extensive beachfront villa is quite simply a masterpiece. One of two private architecturally-designed homes located in a raised beachside setting on the island?s Southeast coast. 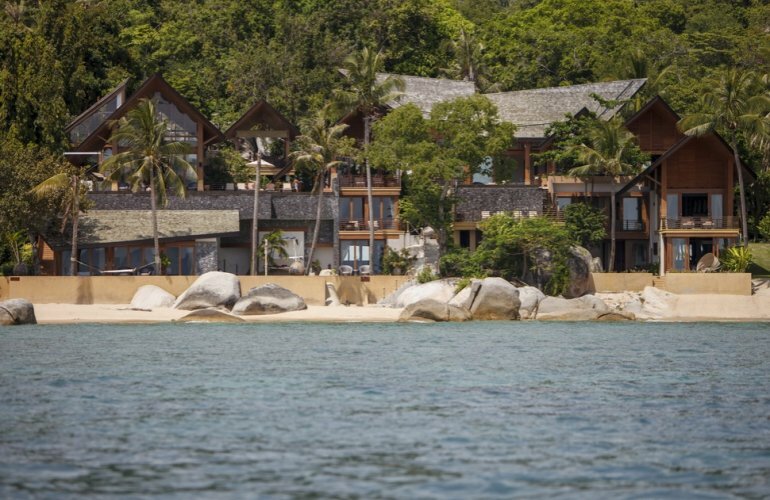 This luxury Koh Samui villa is sat amongst lush tropical surroundings and natural rock formations. The grand and gated home boasts world-class design and accommodation, vast open plan living spaces, seamless proportions, five sumptuous bedrooms and breath-taking ocean views. Blending effortlessly with its stunning surroundings, this remarkable property in Lamai Beach is plentifully proportioned with soaring 10-metre ceilings, rich wooden panelling and natural materials throughout. Slide-away glass walls lead out to immaculately manicured gardens and an impressive pool area allowing a perfect fusion of indoor and outdoor living. From the entrance the interior opens out into a stylish split-level living and dining area and contemporary kitchen. The generous living room features sophisticated and comfortable furnishings and a state-of-the-art entertainment system. A generous dining area features an imposing dining table with seating for up to 20 guests, served by the fully-equipped kitchen featuring a range of cutting-edge appliances. The spacious living and dining areas open onto a furnished veranda and landscaped sandstone sun deck equipped with sun loungers and spectacular views over the outstanding stone-tiled infinity-edge pool and coastal expanse beyond. Adjacent to the pool is a roomy sala with BBQ kitchen and alfresco dining facilities. The villa features five splendid bedrooms including four king-size rooms and one twin room all with flat screen TV's, handsome furnishings, stunning views and en-suite bathrooms. Ample sized wardrobes are home to luxurious dressing gowns and slippers for extra luxury and comfort throughout your stay. The luxuriant en-suite bathrooms are complete with free-standing terrazzo tubs, walk-in rain showers and twin washbasins. For larger groups the villa's equally impressive sister property, Villa 144 is also available. Both homes offer complete privacy and security with a whole host of inclusive facilities and services for the perfect tropical retreat. This luxury villa is ideally located in Southern Lamai just a step away from Lamai Beach with its palm-fringed powdery white sands and sparkling seas, perfect for sunbathing, family-friendly swimming and a wide range of water sports. The villa is equipped with a range of water sports equipment including sea kayaks, a windsurfer, paddle boards, snorkels and more. The villa is situated on Koh Samui's Southeast coast just 30 minutes from the airport, 40 minutes from Santiburi Golf and Country Club and 20 minutes from Chaweng. Lamai town is a short distance with its exciting selection of dining and shopping options, great spas and exciting tourist attractions to explore such as the fascinating Hin Ta Hin Yai rock formations and the beautiful Wat Khunaram Buddhist temple. To the South of the area lies Hua Thanon fishing village with an expanse of lush jungle-clad mountains beyond. Guests can hire a jeep to explore Koh Samui's untouched landscape with its natural attractions and abundance of wildlife including grazing water buffaloes, birds, reptiles and insects plus tiny shack cafes selling soft drinks and delicious Thai food along the way.